— the Squid Sisters' catchphrase. Marie is a part of the Squid Sisters pop idol duo and a host of Inkopolis News, alongside her cousin Callie. Her signature color is lime green. The coloration on the ends of Marie's tentacles. Marie is a very fashionable Inkling and has a more laid-back design in comparison to her cousin. Her tentacles, which are light gray, are tied in a large bow on the right side of her head, with the ends wrapped around to the other side and curling up slightly at the ends, along with a bang swept to the left of her face. Marie also has a faint green tinge at the ends of her tentacles. She has large, downturned eyes with gold irises and light brown pupils in the shape of a plus or a 'ninja star'. Her eye markings end in small, slightly curved points, and her eyebrows are large and oval shaped. Her ears are slightly narrower, longer, and downturned than those of the average Inkling, and on them, she wears a pair of chunky, milky white earrings. Her outfit, which appears to be a corset dress with green lacing in the back, is black with a reflective texture as if covered in sequins. On the front are three bright green marks, which, somewhat morbidly, are made to look like the cuts made in squid when it is cooked, and the underside of the skirt portion is also bright green. With this outfit, she wears lime green tights, black shorts, white gloves, and a small, white, pointed neck accessory giving the impression of a shirt collar. On her feet, Marie wears a pair of black wedge shoes with a texture similar to leather, which have a shiny green material on the bottom and two green buttons on either side of the ankle. She wears a green and white hat resembling a calamari ring and has a birthmark or a beauty mark on her right cheek. It was revealed in Splatoon 2 that she has scars where Callie hit her with a bug net. During a Splatfest, any part of Marie's appearance that is normally lime green will change to match the color of her Splatfest Team, including the ends of her tentacles. As a child, Marie wore traditional Japanese-style clothing, and her tentacles were much shorter and messier. Her first outfit, shown in Sunken Scroll 17, consisted of a black yukata with a white polka dot pattern at the bottom, and a pair of thick black zōri with pink thongs. On the left side of her head, she wore a green and white accessory that simply looked like a smaller version of her current calamari hat. For her second outfit, which was shown in promo art for the Grasshopper vs. Ant Splatfest, Marie wore a white yukata with a seashell pattern in lime green, navy blue, and dull purple. The calamari accessory had taken on a dark purple tint in addition to its existing colors. In Splatoon 2, Marie once again dons traditional Japanese-style clothing that resembles the outfit she wore as a child. Her outfit consists of a black and dark grey kimono with gold triangle patterns around the waist and carries a green parasol with the Cuttlefish brand logo on it. She wears traditional Japanese sandals, or 'geta', and a different, pink, headpiece. Marie is seemingly quieter and not as excitable as her cousin, and usually only gives a half-smile, if at all. She can be sarcastic from time to time, and slightly prone to complaining, but is usually in a mild mood. Overall, her disposition is laid-back and friendly, but sometimes grumpy. She is also an expert at doing impressions, as mentioned by Agent 1. She dislikes overly-thrilling activities, and can even be somewhat lazy. She also does not seem to be a big fan of tomatoes. She has shown a demonstrably more cheeky side, as seen in the Pokémon Red vs. Pokémon Blue Splatfest ending dialogue, where Callie asked how to change the name of Marie's Vulpix she traded her from "BLUEISBEST", and Marie hurriedly ends the broadcast, slyly avoiding the question. In addition to this, when reattempting the final boss fight of Splatoon 2, at one point her dialogue reads: "Octavio, stop hitting yourself! Stop hitting yourself! ", laughing at the fact that DJ Octavio's "fists" need to be shot back at him. She mentions several times on Inkopolis News that her preferred weapon class is the Charger. Given the existence of the Hero Charger Replica and her role as Agent 2, it is possible that Marie used a Charger in Octo Valley. In Splatoon 2, she mentions that she is "more of a charger girl", and in the final battle, Tide Goes Out, she is shown using the Hero Charger. Callie and Marie winning Inkopolis's first annual Youth Folk-Singing Contest. Marie was raised in Calamari County. At a young age, she became interested in singing and entered Inkopolis' first annual Youth Folk-Singing Contest with her cousin, Callie. Their stunning performance earned them a standing ovation from the audience, as well as a first place trophy and certificate. After moving to Inkopolis, Marie worked at Walleye Warehouse with Callie. In English localizations she clearly resented this job, saying that the best thing about it "was quitting" and, in the North American version, apparently burning her uniform. In the Japanese version, however, the worst thing she has to say about working at Walleye Warehouse is that its cafeteria food was greasy. Riding on the fame following her win at the Youth Folk-Singing Contest, Marie joined Callie in creating the Squid Sisters. Their repertoire includes a modern take on an ancient melody, a song unique to Splatfests, and a song used to defeat DJ Octavio. They have risen in notoriety, eventually becoming Inkopolis' premier pop icons, performing at Splatfests, and hosting Inkopolis News. Over the course of the two years after the events of Splatoon, the Squid Sisters slowly drifted apart. Following the final Splatfest, they were rocketed to even greater fame as the biggest stars in Inkling society. However, after they released their first solo recordings, they began following separate paths. While Callie began making guest appearances on variety shows, Marie began putting on solo concerts, appearing on music shows, and even starting a career in theater. Their schedules allowed for little quality time spent together, but when they were together their relationship seemed to be intact. Unfortunately, Callie suddenly disappeared, which Marie discovered when she failed to show up for vacation back home in Calamari County. Fearful for what may have happened to her, Marie soon found that DJ Octavio had escaped his prison and moved to Inkopolis Square, where she hoped to find a new Inkling to help stop the Octarians as Agent 3 did in the past, taking a break from her career and going into hiding. Fortunately, Agent 4 did not know who she is. Callie and Marie in the studio. 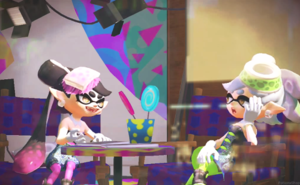 Marie hosts Inkopolis News with her cousin, Callie. Callie usually interjects humorous statements regarding stage news, often poking fun at Marie in the process. Marie often groans at Callie's puns but is known to make silly comments herself. An example of this is when Callie asks her about strategic advice. Her responses can range from amusingly obvious to almost nonsensical, and may occasionally even stray off the topic of battle altogether. Marie also helps announce update and Splatfest news, and can be seen chatting with Callie in Inkopolis News Studio on the second floor of Booyah Base. She, along with Callie, first appeared in issue 1 of the CoroCoro manga Splatoon, where she announced the CoroCoro Cup. She and Callie are hosts and commentators for that tournament. She now often appears in issues starting with issue 2. 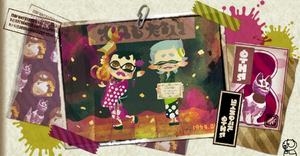 In the Hero Mode issue, she takes the role of Agent 2, together with Callie, who is Agent 1. They appear in the fight against DJ Octavio and battle alongside both Agents 3, with Marie using the Hero Charger. Whenever a Splatfest occurred in Splatoon, Callie and Marie would announce the theme prior to the event, each siding with a specific team. When the day of the Splatfest arrived, they could be seen singing and dancing atop trucks equipped with platforms and stage equipment. Upon the event's conclusion, they announce the winner in a special segment of Inkopolis News. While Callie won twenty-six Splatfests, Marie only won nineteen, but she won the final Splatfest. In Splatoon 2, Callie and Marie's jobs as Splatfest hosts are taken by Pearl and Marina, members of Off the Hook. Agent 2's icon in Octo Valley. As hinted throughout Octo Valley, Marie is Agent 2 and Cap'n Cuttlefish is her grandfather. While posing as Agent 2, she wears a green hat with her bang showing, a white face mask, and what appears to be a green t-shirt. Noticeably, her eyes appear to be black and her beauty mark is not present. Her attire suggests she is hiding her real identity from any fans that might happen to see her. Throughout Octo Valley, Marie is heard communicating to Cap'n Cuttlefish, Agent 1, and Agent 3 regarding the looming Octarian menace. By performing the Calamari Inkantation with Agent 1, or Callie, Marie is able to distract DJ Octavio and free the Cap'n in the Octo Valley mission Enter the Octobot King!. Marie returns as a major character in Splatoon 2's Hero Mode in Octo Canyon. This time, she is more open about her identity as Agent 2 and fills Cap'n Cuttlefish's role as Agent 4's main advisor and guide, as the Cap'n is out on a research trip with Agent 3. As Agent 4 fights through the Octarian complex in search of the Great Zapfish, Marie reveals to the player that Callie went missing at the same time as the Great Zapfish and suspects Octarian involvement. After beating the The Octo Shower, she and Agent 4 receive a call telling them to leave Octo Canyon and never look back. However, Marie quickly realizes that the caller is Callie due to the fact that the caller is holding the phone upside down (a recurring gag in the original Splatoon single-player). In the final boss battle, it is revealed to the player and Marie that Callie has been brainwashed by DJ Octavio using his hypnoshades and are forced to fight him and Callie; as the battle continues, Marie is able to shoot off the hypnoshades with a Hero Charger filled with "Low-Tide Ink", slowly bringing Callie back to her senses. When Callie finally makes a full recovery, Marie is able to pull out a boom box playing Calamari Inkantation, allowing them to distract DJ Octavio and letting Agent 4 to finish him off, saving the Great Zapfish. 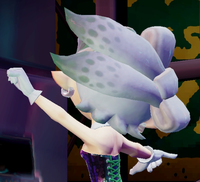 Although she does not make a physical appearance, Marie makes a cameo through text messages in Marina's chat room under the username of Agent 2. Marie appears to have stumbled upon the chat room by accident and displays a fear of it being a dating site. She then communicates with Cuttlefish and convinces him to meet her at Cuttlefish Cabin for dinner she will cook, which, at Cuttlefish's request, will be seaweed stew. Together with Callie's name, Marie's name forms the word "calamari", which is an Italian squid dish. If the player revisits the final boss battle in Splatoon 2 after beating it once, it is revealed that Marie never realized that Callie and her name spells out "calamari" until Callie said the word "calamari" out loud. Marie's Japanese name is derived from a real-world species: "Hotaru-ika" is the Japanese name for the Firefly Squid. Marie's hair accessory looks like 'ika ringu', a Japanese form of calamari. Like Callie, Marie's hat is not attached and can be seen flying off of her head for a moment when she jumps. It is shown in the Go all out! vs. Focus on healing promo art and Japan Expo Paris art that she uses her hat as a hair band. The same could go for Callie. Several fans have noted that Marie resembles Jeanne from the Bayonetta series. It is unknown if this was intentional. Marie's favorite weapon class appears to be Chargers. 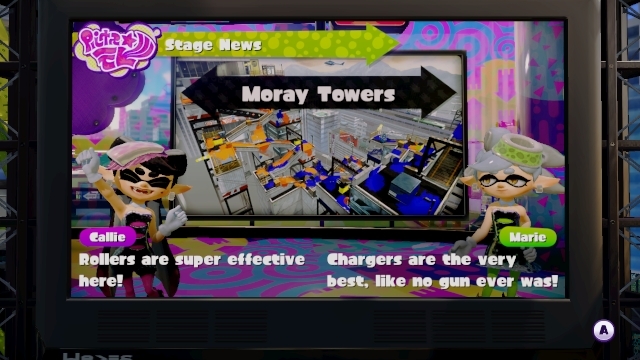 During the Inkopolis News when discussing weapon preferences for Moray Towers Marie will say "Chargers are the very best, like no gun ever was." This is a reference to the opening lyrics used for the intro for the first season of Pokémon's English dub. This is confirmed in Splatoon 2's Octo Canyon mode, where after asking Agent 4 what is their preferred weapon, she will add "Personally, I'm a charger girl". Her main weapon is shown to be the Hero Charger or its replica, likely from her time in the role of Agent 2. This is shown in her artwork for the Go all out! vs. Focus on healing Splatfest. In the final battle, she uses a Hero Charger to take out Callie's hypnoshades. Marie seems to be cross-dominant; she has been shown writing with her right hand but holding chopsticks with her left. Although her hair is mostly light gray, Marie's normal ink color is lime green, as proven by her amiibo figure. This is also shown when Marie is in squid form, as seen in Super Mario Maker and Miitomo. The Splatoon 2 artbook states that Marie's kimono has the Kensaki family emblem embroidered upon it. It is unknown whether or not she is related to Toni Kensa, known as Tataki Kensaki in Japan. Worth noting is that the armor found in Octo Canyon has the Toni Kensa logo and uses the iconic monochromatic color palette and that both Marie and the Toni Kensa advertisement models have white hair, otherwise unseen on other Inklings. Marie states in Into the Octo Oven that she refuses to eat the end loaves of bread. For images of Marie and Callie together, see Squid Sisters/Gallery. Marie waving in the studio. Closeup of Marie, showing the plus-shaped pupils unique to her and Callie. Marie dancing during a Splatfest. Marie's eyes next to her team's Splatfest Power. Official animation of Marie from a promo video for Splatfests. A Marie-themed postcard for the final Splatfest. Marie watching Callie's performance on their final Splatfest. Marie as she appears in the Splatoon manga. Marie performing City of Color in their first live at NicoNico Tokaigi 2016. Marie singing Tide Goes Out live at the Chokaigi 2016 Live Concert. Marie live at Japan Expo 2016. Marie live at NicoNico Cho Party 2016. The Marie amiibo in its packaging. Marie introducing herself to Agent 4. Marie from the back in Splatoon 2. Marie using the Hero Charger. Marie bringing Callie to her senses. Marie's icon during Tide Goes Out. Marie listening to the music during a Splatfest in Inkopolis Square. A mem cake of Marie from the Octo Expansion. Concept art of Marie in her kimono and other casual wear. Concept art of Marie in her casual getup. French Oly With Callie's French name (Ayo), it sounds like aioli. German Limone From limone (lime), referring to her main color and also as a pun for a sauce. Italian Marina From marina (marine). With Callie's Italian name (Stella), it forms stella marina (starfish). Spanish Tina Feminine name, Spanish for tub. With Callie's Spanish name (Mar), it forms Martina. ↑ referencing to an article of Splatune. This page was last edited on 22 April 2019, at 10:55. This page has been accessed 348,049 times.